A distant view of Dr Harrington's house at Kelston, near Bath in Somerset, taken from the upper Bristol road. 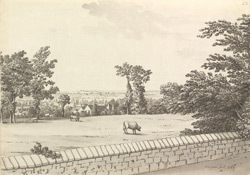 Kelston was the home of the Harington family, whose family house survived until 1764-5 when it was pulled down and Kelston Park built to replace it. Their estate originally belonged to Shaftsbury Nunnery and was given to Audrey Malte after its dissolution, who then married John Harrington of Stepney. This is the house of Dr Henry Harrington (1727-1816), who was born at Kelston and became a musician, author as well as a physician at Wells. Unusually for the 18th century, he lived to be 90 years old.